Wiseson-in-law knows that mother-in-law, like any other woman likes to get gifts. And the best gift for a woman is a bouquet of flowers. 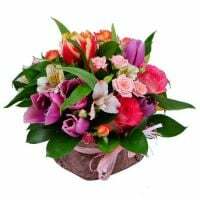 That's only if a selection of compositions for the wife usually is without problems, then there can be some difficulties with a bouquet for mother-in-law. So, what flowers to give your wife`s mother? The first and most important rule - the flowers should be with fully uncovered buds. It will once again highlight all the beauty of mature women. But unopened buds should be given only young girls, as if alluding to the fact that their maturity is yet to come. The second important rule - the flowers should have large buds. Small buds can be used only as a supplement to whole composition. Decoration is equally important - bunch must have decorative elements. As for the flowers, which are not packaged and tied with a ribbon, then it`s better to abandon once and for allfrom such an option. Please your family with AZ-Flowers.com!